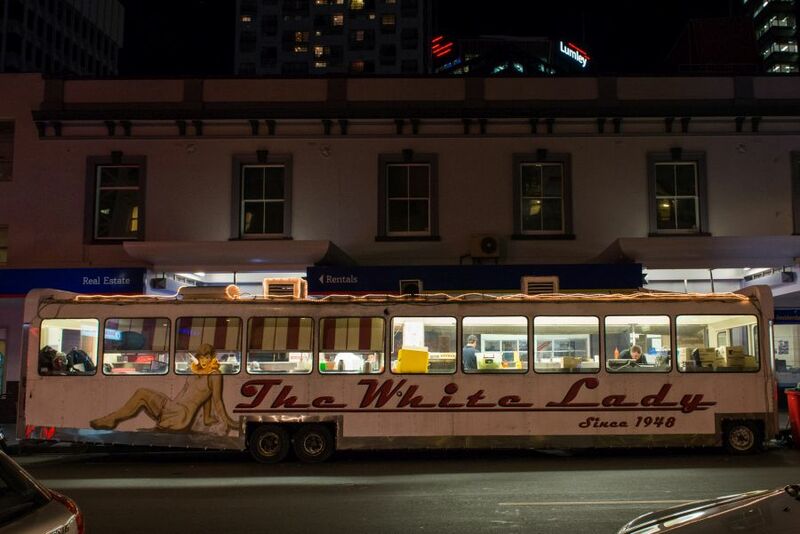 We found The White Lady bus by accident on one of our evening walks into Auckland city while staying at the Pullman Hotel. 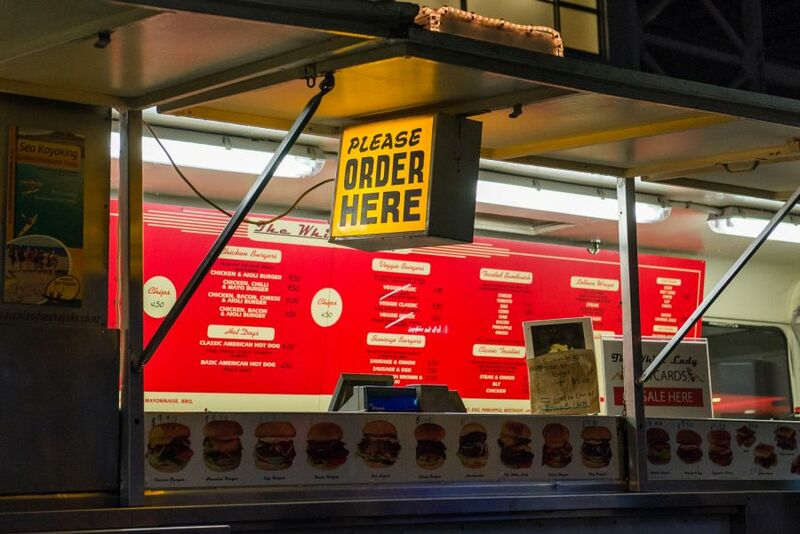 A quick google revealed we’d stumbled on one of Auckland city’s icons, a dusk-to-dawn burger bus owned and run by the Washer family since 1948. After returning from our Waiheke Island jaunt for one last night in Auckland, we were determined eat a burger at The White Lady. 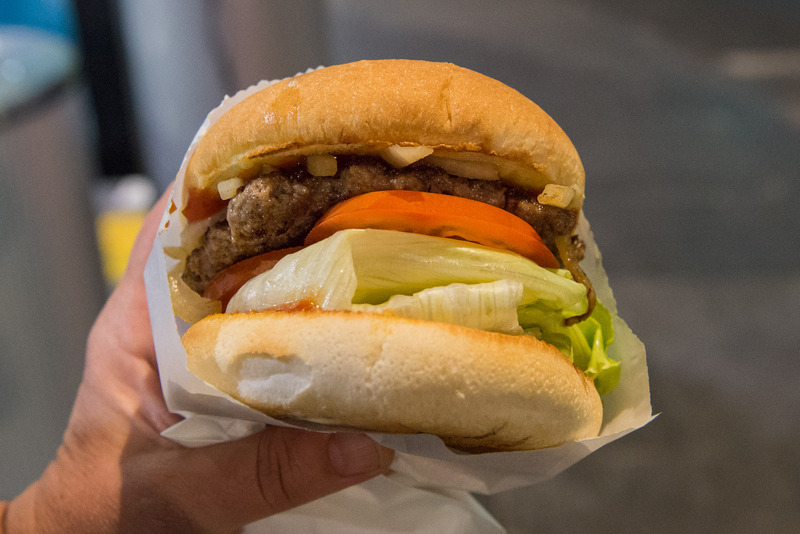 Having shared a fancy hotdog at Imperial Lane, we now split a burger (NZ$7.90, White Lady-made beef pattie, fried onions, sauce, lettuce and tomato). Months later, we still think and talk about this burger, made to order and proof that ‘simple’ can be absolutely stunning when done right. 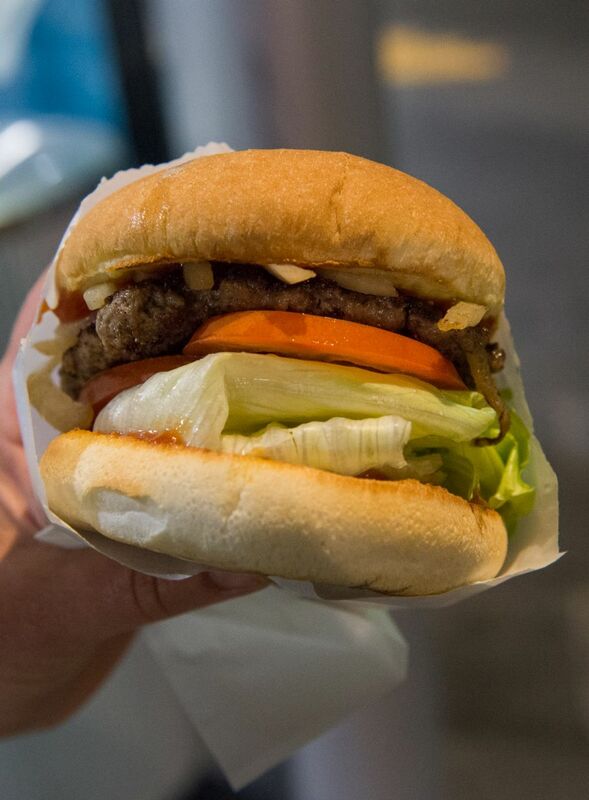 I can almost taste that tender, juicy beef pattie and the sweet fried onions, and feel that chewy, soft, buxom bun. Jac still talks about the lettuce – not shredded, but a fresh, crisp leaf folded, adding a subtle crunch to every bite. Utterly sensational. Didn’t even notice we were eating it standing next to a rubbish bin until I looked at the photos later. With such burger magic voodoo (as my mate Prez would say), it’s not surprising The White Lady’s been around for so many years. We chatted with The White Lady guys and one of them told us about his favourite place for dumplings that wasn’t too far away. Burger demolished, we jumped into a cab in hot pursuit of steamed handmade dumplings. So far, a great last night in Auckland! 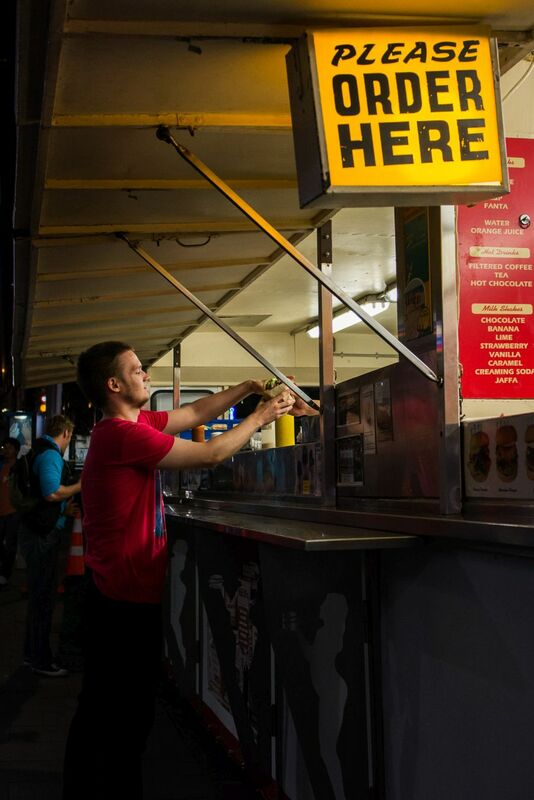 I blogged recently about Alfred’s Kitchen, a late-night burger icon in Perth. 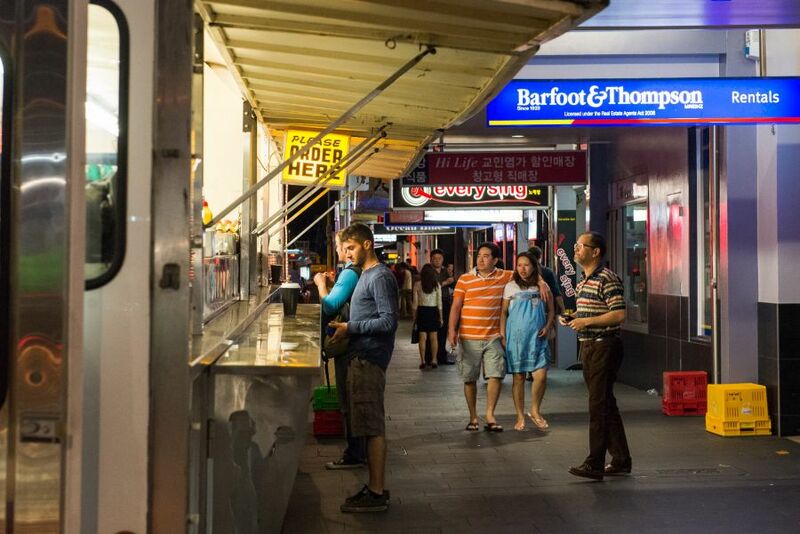 Every city has its favourite late-night takeaway. Where’s yours?